Home > Facial Surgery > What is Revision Rhinoplasty? Most people undertake plastic surgery on their nose with high hopes, anticipating the sleek, aquiline schnoz they’ll eventually have when the surgeon puts his or her tools down and the swelling subsides. Like many types of plastic surgery, a nose job can always go wrong. And when it does, the majority of patients seek another operation – often, surprisingly, with the same plastic surgeon – to rectify it. This is known as “revision rhinoplasty” – rhinoplasty is another word for nose job. Put simply, it’s of way of repairing a bad nose job, which can occur either due to a plastic surgeon’s poor operating skills or simply as a matter of chance. It is estimated that as many as 15 per cent of patients who have nose jobs go back at least once to have their initial procedure repaired. Plastic surgeons cannot always predict the outcome of a nose job with one hundred per cent certainty, and as more and more people have cosmetic procedures down, the scope for them being botched up increases. As with all types of plastic surgery, having realistic expectations is key. it's important that potential patients realise that complete symmetry is not always the ideal when it comes to the face. A few facial flaws can add to human beauty, and insisting on absolute “perfection” can often lead to disappointment. People decide to have a nose job repaired due to a variety of reasons. Remember, it is a lot easier to add something to the nose than to take something away, and that every type of surgery carries its own inherent risks and is not something to enter into lightly. Too much has been taken off the nose, especially the tip. This is a very common reason for having subsequent nose jobs. The tip appears twisted or unnatural-looking. This is yet another common reason to do a nose job for a second time. The nose overall no longer appears natural. A nose that has been over-operated on can often benefit from revision rhinoplasty. Following initial surgery, the nose appears too small. A good plastic surgeon can add to the nose, making it appear the right size for the face. Difficulty breathing through your nose after surgery. In some cases, scar tissue left over from previous surgeries can block airways. It’s important to keep in mind that there are some instances where revision rhinoplasty is not possible, as some noses are simply beyond the point of repair. Also, excessive scarring in the nose, perhaps due to previous surgeries, may prevent a surgeon from successfully completing a nose job. If you think your initial nose job could be improved upon, it might make sense to go back to the same surgeon. Most are happy to re-do a procedure - often for free - if you can explain fully why you are dissatisfied. If, however, your first surgeon botched up your initial nose job, you may be advised to seek revision from someone else. Make sure you only use a Board-certified surgeon, preferably one who specialises only in the nose, and who doesn't branch out into other areas such as the breast and thighs. You are also well-advised to use only someone who is a member of the The British Association of Aesthetic Plastic Surgeons, or BAAPS, which has a strict code of ethics all its members must follow. At least then you will have some recourse if it all goes pear-shaped again. Some people are unhappy with the way they look no matter how many nose jobs they have, thinking that attaining their ideal of beauty is completely out of their reach. They seek to have more and more surgeries or cosmetic procedures, never happy with the outcome. In cases such as this, a visit to a qualified counsellor might make more sense to rule out BDD (Body Dysmorphic Disorder) or some other type of self-image problem. 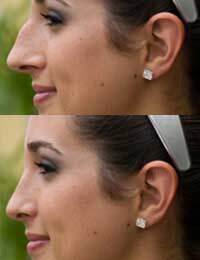 Having the "perfect" nose will not completely change your entire self image, it will just give you a cuter nose!